Valves are linear with parallel or slightly convex sides. The apices are rostrate (much narrower than the valves). The axial area is narrow and widens abruptly just short of the central area. The central area is a rhombus, which widens along the apical axis to form a variably narrow to broad transverse fascia. The slightly curved raphe is lateral. Proximal raphe ends are deflected to one side and terminate with small pores. Distal raphe fissures are shaped like commas or question marks. The distal raphe fissures are surrounded by striae at the poles. Striae are strongly radiate near the valve center, becoming strongly convergent near the apices. Occasionally an isolated short stria will occur on one side of the central fascia. Pinnularia microstauron is one of the most common and widely distributed species of Pinnularia, including a large complex of species and varieties. Here, observations are made of the nominate variety. The specimens of Pinnularia microstauron observed here were collected from the Carex and Eleocharis zones of a floating-mat fen on the Helena National Forest in western Montana. Here pH measured 6.77 and specific conductance measured 19 µS/cm. Krammer (2000) reports that this species prefers oligotrophic, oligosaprobic waters with a low electrolyte content and low pH values, and that the nominate variety prefers cold, oxygen-rich moorland waters with a very low electrolyte content. 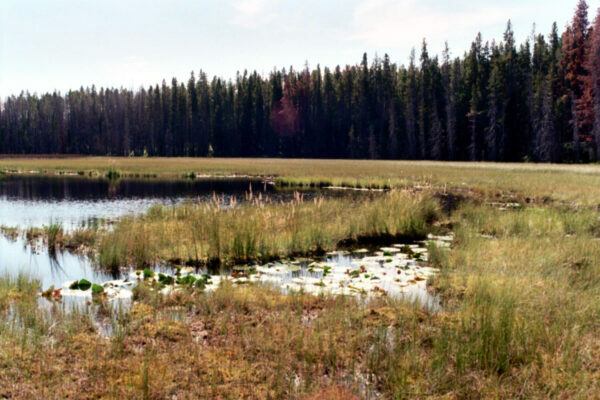 Drosera Pond at Indian Meadows Research Natural Area, Helena National Forest, Montana. Ehrenberg, C.G. (1843) Verbreitung und Einfluß des mikroskopischen Lebens in Süd- und Nord-Amerika. Abhandlungen der Königlichen Akademie der Wissenschaften zu Berlin, 1841: 291-445, 4 Tafel. 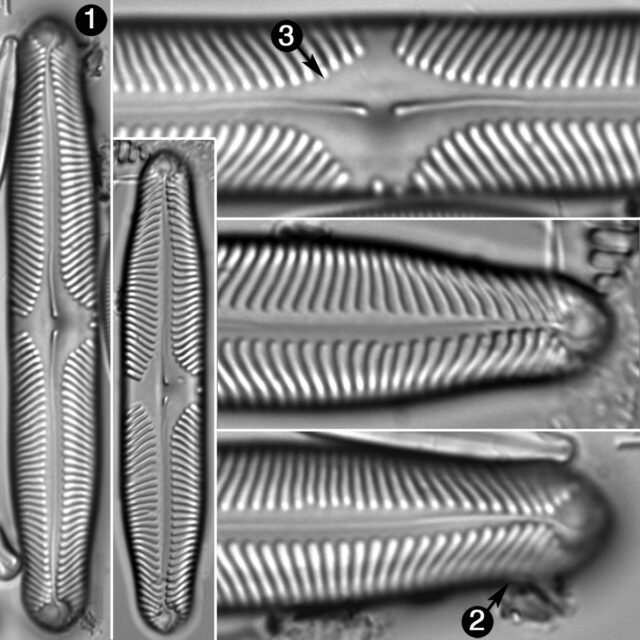 Pinnularia microstauron has linear valves with rostrate apices. The central area is a rhombus, variously expanded into a narrow to wide fascia. Striae are radiate in the valve center, convergent near the apices, and number 9-11 in 10 µm.